Peanut Butter Cake rolled into bite sized balls and filled with a taste of raspberry preserves! Love this recipe! Whisk together the flour, baking soda, baking powder, and salt; set aside. With an electric mixer, cream the butter, sugar and peanut butter together until pale and fluffy. Add the eggs, one at a time, beating until each is well incorporated. Reduce speed to low and mix in greek yogurt and vanilla extract. Gradually add the flour mixture; beat until just combined. Pour batter into a greased 13x9" pan. Bake approximately 28 minutes or until the center comes out clean and edges are golden brown. Let cool. Once cool, crumble cake into a large bowl. Add frosting and mix thoroughly. Roll mixture into 1” balls and place in the refrigerator until firm (approximately 30 minutes). Remove mixture and use a wooden dowel to create a deep hole in the center of each cake ball; reserving 5 cake balls. Using a toothpick or small measuring spoon, spoon a small amount of jam into each hole. Using the reserved cake balls, pinch a small amount off and use your fingers to smooth it over and seal the hole that is filled with jam. Place the jam-filled cake balls in the freezer for 15 minutes. Melt CANDIQUIK in tray according to package directions. Once melted, stir in 1½ tablespoons of peanut butter into each package of coating. Transfer the CANDIQUIK into a deep bowl. drip off and set on wax paper to dry completely. 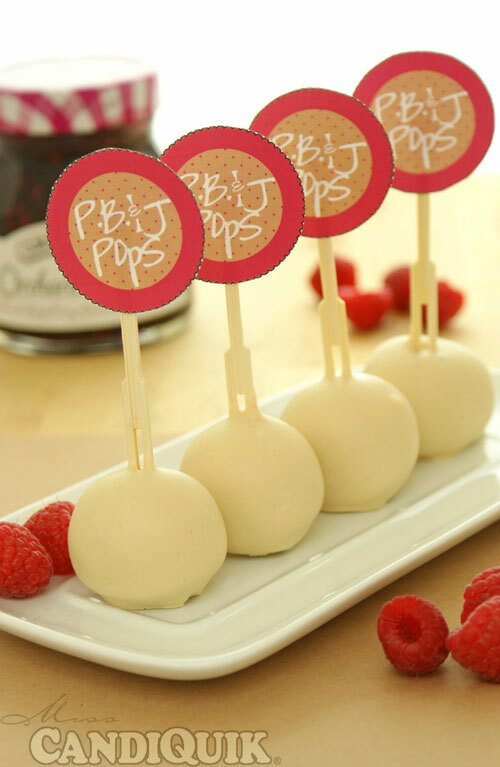 *I typically don't FREEZE cake pops, but I did with these because of the jam filling. *With any cake pops, be careful not to store in the freezer too long - otherwise they may crack after you dip them in the candy coating. *When dipping cake pops, remove only a few at a time and keep the remaining cake balls chilled.